From the Cumberland Gap to the Atlantic Ocean, this is Virginia Water Radio for the week of March 23, 2015. This week, we feature a Blacksburg- and Roanoke-based band with a tune to mark spring’s arrival and give a bit of water-credit to winter. Have a listen for about 35 seconds. You’ve been listening to part of “Winter’s Fall,” by No Strings Attached, on their 1999 album, “In the Vinyl Tradition, Vol. II,” from Enessay Music. In one sense, the “fall” in the title brings to mind the welcome end of winter and the bursts of biological activities that start in spring [SOUND – Spring Peepers - ~3 sec] and continue through summer and early fall [SOUND – Evening insects in early October - ~2 sec]. 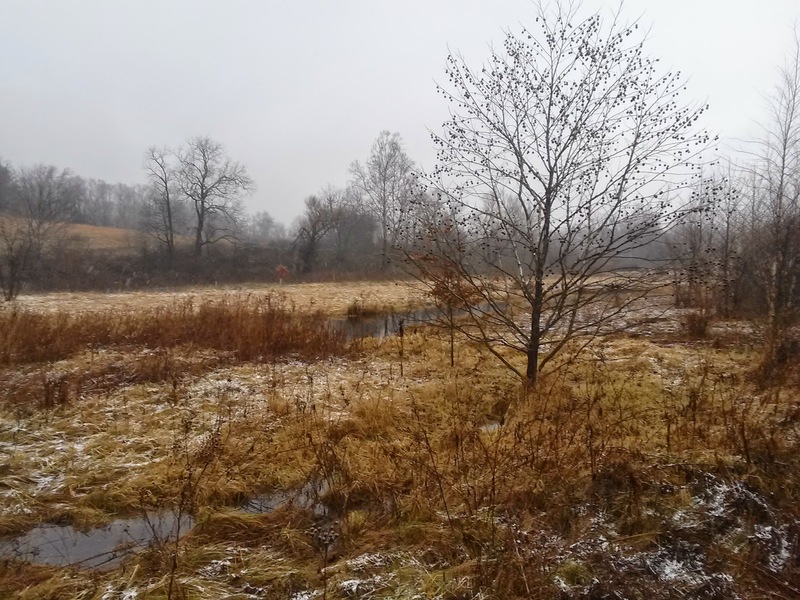 Snow and ice on December 30, 2014, in Blacksburg, Va., at a temporary pond that provides spring breeding habitat for frogs and other amphibians. “Winter’s Fall,” and “In the Vinyl Tradition, Vol. II,” are copyright by No Strings Attached and Enessay Music, used with permission. More information about No Strings Attached is available from their Web site, http://enessay.com/. The sounds heard were Spring Peepers in Blacksburg, Va., March 11, 2015; and various night-time insect sounds in Blacksburg, October 2, 2014. Southeast Regional Climate Center at the University of North Carolina-Chapel Hill, “Monthly and Seasonal Climate Information,” online at http://www.sercc.com/climateinfo/monthly_seasonal. Virginia Drought Monitoring Task Force, “Drought Status Report for March 2015,” accessed 3/23/15 online at http://www.deq.virginia.gov/Programs/Water/WaterSupplyWaterQuantity/Drought.aspx. Western Regional Climate Center, “Average Statewide Precipitation for Western States,” online at http://www.wrcc.dri.edu/climate-summaries/. U.S. Geological Survey, “Water Resources of Virginia,” online at http://va.water.usgs.gov/. Virginia Department of Environmental Quality, “Water Supply and Quantity,” online at http://www.deq.virginia.gov/Programs/Water/WaterSupplyWaterQuantity.aspx. For previous Virginia Water Radio episodes on water supply, weather, or winter, please see the “Groundwater,” “Overall Importance of Water,” and “Weather/Natural Disasters” categories in the Water Radio Index above (specific link: http://www.virginiawaterradio.org/p/index.html).